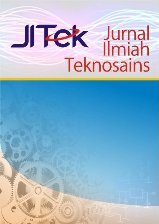 JITek: Jurnal Ilmiah Teknosains [p-ISSN (Print) 2460-9986 | e-ISSN (Online) 2476-9436] published scientific papers on the results of applied and natural science research covering the fields of science including engineering (civil, chemistry, architecture, electrical, mechanical, enviromental), food technology, agriculture, physics, biology, mathematics, chemistry and technical information. Editor accepts the article has not been published in other media with the writing format as listed on page manuscript writing guidelines. Manuscripts will be reviewed by an expert editor and managing editor. The journal has been indexed in Google Scholar and published two times a year, on May & November.